I am a writer and radio journalist at the Columbia Journalism School in New York, focusing on natural resources and the environment. Formerly, as a public radio producer and director, I filed stories from New England to the Deep South, the Rust Belt to the Rockies. From 2014 to 2018, I was based in Boston at NPR's midday news magazine Here & Now, covering a range of topics, including politics, science, technology and the arts. Between 2011 and 2014, I produced and directed for NPR & WBUR's On Point. I am also a photographer and classically-trained composer with a bachelor's degree in music from Northeastern University. I'm pursuing a master's of arts in journalism while at Columbia. BUZZARDS BAY, Mass. – As the opioid epidemic continues to worsen in the U.S., some jails and prisons have turned to a medication called Vivitrol to treat inmates. But the drug is expensive, and many inmates rely on Medicaid to keep treatment going after they leave prison. Here & Now's Dean Russell visits two facilities using Vivitrol to help inmates suffering from opioid addiction. CHARLESTON, S.C. – On the minds of many voters in South Carolina is one of the greatest tragedies to hit state in modern history: the mass shooting at Charleston's Emanuel African Methodist Episcopal Church, often called Mother Emanuel. Rev. Anthony Thompson lost his wife, Myra, that night. He shares that experience, as well as his thoughts on the 2016 election, with Here & Now's Jeremy Hobson. In recent decades, obesity has become one of the greatest problems facing the United States. Since the 1980s, the number of overweight and obese people has more than doubled. In this five-part series, Here & Now takes a closer look at obesity: causes, risks, prevention and cultural biases faced by people living with obesity. American music can mean a lot of things to different people. For the Americana band Blitzen Trapper, "American music" means the music that reminds them most of home: rural Oregon and Portland. As part of Here & Now's American music series, the guys of Blitzen Trapper talk about quintessential American music as they hear it, and explain how American roots music has influenced their sound. In August 2015, the travel publication Wildsam sent Dean Russell on a two week and 2,500 mile tour of unknown New England. 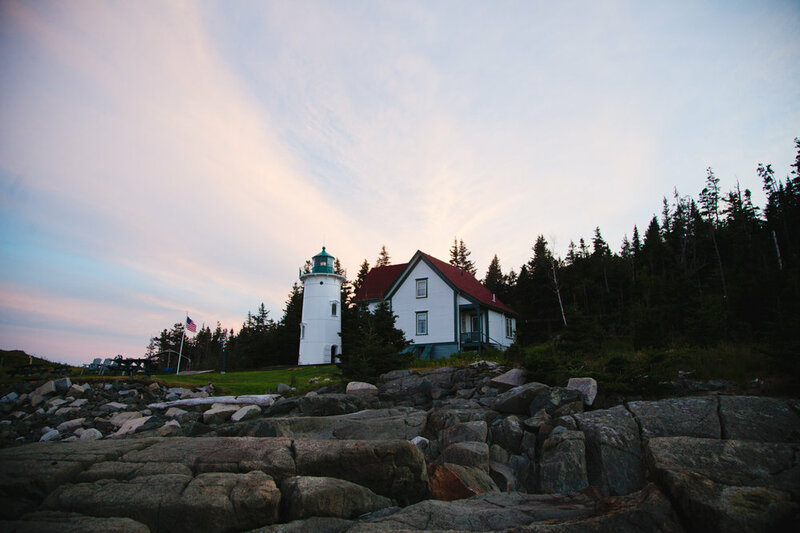 Dean set out aiming to learn more about New England’s relationship with the elements, from fish processors and micro-farmers to bookkeepers and metalworkers to lobstermen and lighthouse operators. CUTLER, Maine – The tide was almost too low by the time we made it to Cutler. Terry and Cynthia Rowden waited in the harbor with the motor idling. Cynthia was holding a pizza. Cold by now. They waved us down to the landing where we shook hands and crawled into the flatboat. Michelle went first. The Rowdens had been keeping Little River Light on and off for years. Terry was from Michigan and the lighthouse was what brought him to Cutler as a Coast Guardsman in the 60s. Quoddy Light, north about 20 miles, was his original post, but he switched with another guy who had just bought a sports car. You can't drive a sports car on a 15-acre island. Plus, a little while into his stay, he'd meet Cynthia, a local girl. They'd get married. And Terry wouldn't get reassigned to Vietnam like the other guy. The voice is Thebe Kgositsile, the teenage rapper and producer better known as Earl Sweatshirt, if you know him at all. At 19 years old, Earl looks much younger in the YouTube upload from the hip hop show “Sway in the Morning.” Earl is skinny – sitting next to the hulking, 42-year-old host Sway Calloway, he’s really skinny – with a high forehead and wide-set eyes. His motions are two-parts measured, one-part unsure, as he speaks cautiously into the mic. They’re talking about one of the most anticipated hip hop releases of 2013 — his debut major label studio album “Doris”. NEWPORT, R.I. – John J. McCauley III: It’s not a household name. Nor is the name of his band, Deer Tick. But for anyone who is familiar with New England’s folk scene; for anyone who has visited the Newport Folk Festival in its recent years; for anyone who has ever even been near Newport in the last weekend of July: you may know his face, and you’ll definitely know his voice. It’s Friday night. The rain has soaked Newport and its flush of 10,000 festival-goers raw. I’m standing in mud, singing at full capacity, and it’s hard to tell if the wetness on my face is from a leak in the performance tent or a real, honest-to-God reaction to what I’m witnessing, what I’m hearing.